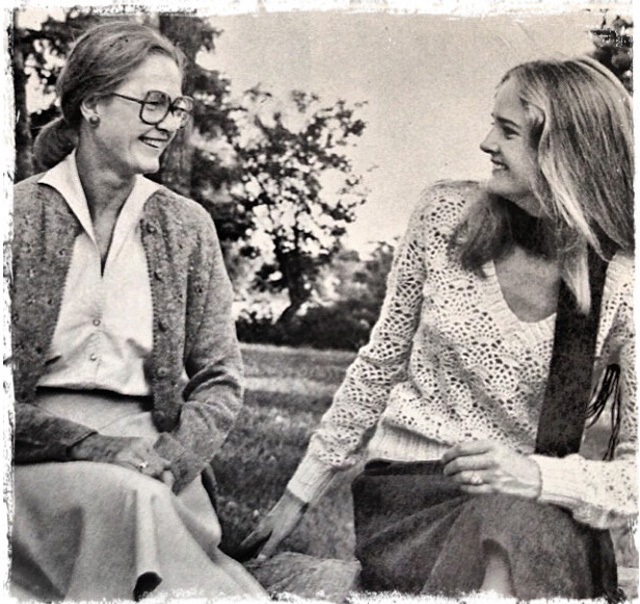 Biddy and Annie Hurlbut on Canaan Farm in the ’70s. Over Peruvian Connection’s 37 years, we’ve trekked to some magical places, searching for the perfect backdrop to photograph our globally-inspired collections. The first few catalogs were shot in the backyard at Canaan Farm, where the company began. Founders Biddy and Annie, as well as their family and friends, modeled the latest styles. Soon after the catalogs were shot in the parks of Kansas City, in the dusty canyons of Santa Fe, then Mexico, Central America, South America, Europe and the Mediterranean, and the United Kingdom. Photo shoots evolved into more sophisticated productions, taking an expanded roster of talented crew further from home. 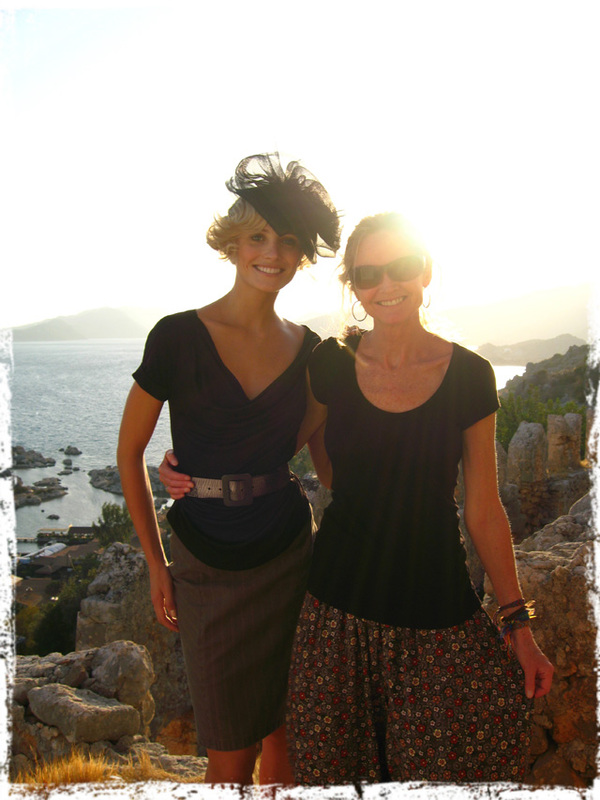 Our model with Annie (in typical Turkish attire to beat the 100 degree heat) overlooking the bay in Kekova, Turkey. One of the most memorable locations was one that was completely unplanned. Intending to shoot in Istanbul, our efforts were thwarted by huge crowds that made it a logistical nightmare. We scrambled to find a new location, and after 5 hours of travel by plane, car, and water taxi, we finally arrived in a mysterious new place under cover of darkness. We photographed our Resort ’08 catalog on the remote island of Kekova, Turkey, where the ancient ruins of a Lycian city rose from the turquoise water. The villagers of Kaleköy may have been initially surprised by our eclectic entourage of photographers, stylists, models and equipment but they quickly adopted us during our stay and made us feel right at home. We were especially enamored by their menu of eggplant with fresh-picked basil, local fish, yogurt, warm crusty bread and fruit. See the video from our photo shoot in Turkey. Mariachis serenading our model in Oaxaca, Mexico. The lively culture, welcoming people and local cuisine of the various locations are etched in our memories as much as the gorgeous scenery. The fiestas and flavors of Latin America have enriched many of our catalogs, with shoots all over Mexico, Guatemala, Colombia, Argentina, and of course, Peru. In the altiplano near Urubamba, Peru. Cuzco, Peru is the real birthplace of Peruvian Connection, where Annie Hurlbut visited the markets and first encountered sweaters handknit of luxurious alpaca. Every few years we return to Peru for our photo shoot, where the Andes and the ancient Incan walls set the scene for our newest collection. Quechua women spinning yarn in the village of Chincheros, Peru. In an effort to dodge the Fall hurricane season in much of the southern US and Mexico, we have ventured to the Mediterranean for many of our Spring catalog shoots. The spectacular scenery, old-world charm, sunny clime, and of course the amazing food have put Italy, Greece and the south of France near the top of our list. Shooting amidst the grandeur of Italian frescoes. 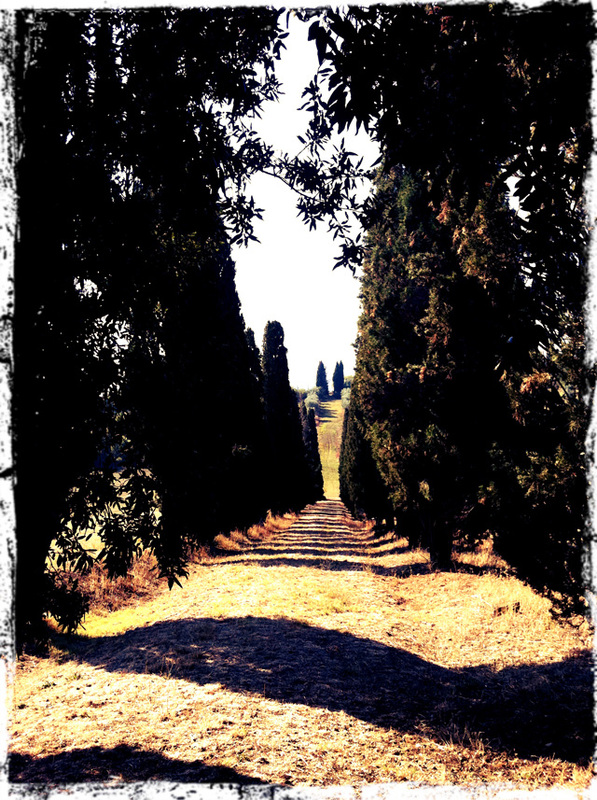 A Tuscan allée of cypress trees, made famous by scenes in Gladiator. 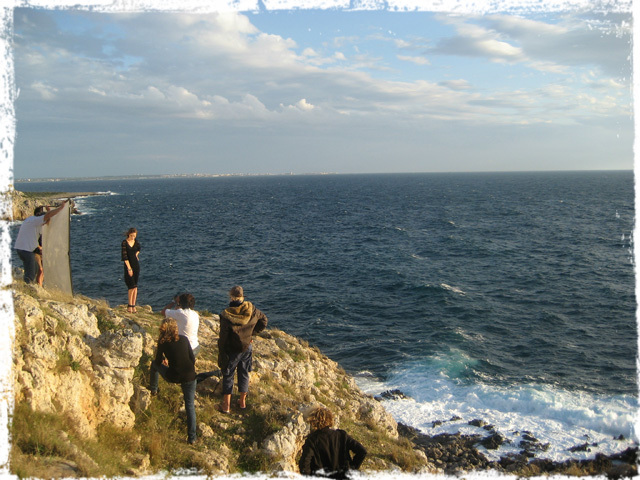 A model poses precariously on the rocky cliffs of Gallipoli. For a closer look behind-the-scenes, check out the videos from our photo shoots. Thank you — ove seeing all the shots – and have enjoyed the catalogs and their backgrounds for years !! So glad you’ve enjoyed the catalogs and various backgrounds! Thanks for your comment. Congratulations on the exciting Journey Peruvian Connection leads you upon. Wish I had kept my earlier catalogues !! Have you ever thought of reviving some of your clothing successes from previous times? of not using child labor. A positive model for others to follow. It has been an exciting journey indeed! Yes, we have talked about bringing back some of the customer favorites from past years, and hopefully will do so for our upcoming 40th anniversary. There are so many that are just as relevant today as they were many years ago. Thank you for your support and for your comments. Do you still sell that chic little black hat the blonde model is wearing on the Turkish coast? If not, please bring it back. No, I’m sorry, we don’t. We had a similar one since, but it has been a while. I will pass your suggestion along to our accessory designer though–thanks for the feedback! I, along with a group of students from Mount Mary University, Milwaukee, WI, recently stayed in Arequipa, Peru for five weeks in May 2013. 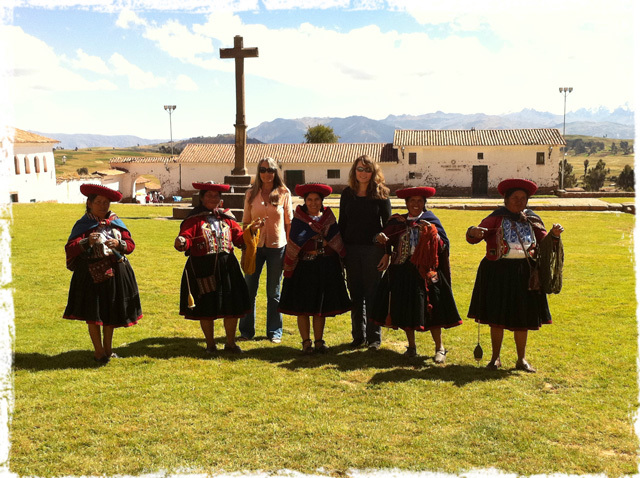 We actually visited Chincheros, Peru, to see the chapel there and shop the local artisan shops. Our tour guide, Maria, also took us off of the “beaten path” and took us to a place where the women make and dye yarn as their ancestors did thousands of years ago. Thank you for sharing this picture of Chincheros, Peru, because it brought back wonderful memories of that day and a lifetime! Chincheros is such an amazing place–you are so lucky to have experienced that place and adventure. Glad we could help you relive that day! Yes, those boots are from Aldo. They are from several seasons ago though, so they probably are no longer available, unless you were to find them on Ebay.